Dutch tennis player Robin Haase returns a ball to Swiss Stanislas Wawrinka during their Davis Cup world group play-off match Netherlands vs Switzerland on September 1 in Amsterdam. Wawrinka and Roger Federer have slumped to a 6-4, 6-2, 5-7, 6-3 defeat to Haase and Jean-Julien Rojer as the Netherlands stayed alive in their Davis Cup World Cup play-off with Switzerland. Roger Federer and Stanislas Wawrinka slumped to a 6-4, 6-2, 5-7, 6-3 defeat to Robin Haase and Jean-Julien Rojer on Saturday as the Netherlands stayed alive in their Davis Cup World Cup play-off with Switzerland. Federer and Wawrinka, who were doubles gold medallists at the 2008 Olympic Games, had both won their singles on Friday to give the Swiss a 2-0 lead. “We never panicked even when Switzerland won the third set. 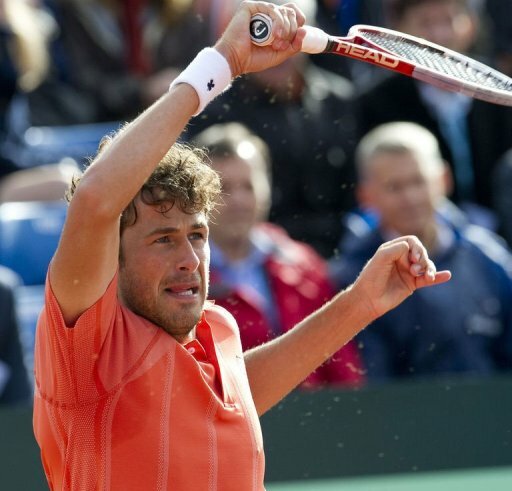 We stayed concentrated throughout the match,” said Haase. The tie will be decided on Sunday when world number one Federer tackles Haase, the world 41, in the opening reverse singles, before Wawrinka takes on Thiemo de Bakker. “It won’t be an easy job but I will give it everything against Roger,” said Haase. Davis Cup: Will the proposed changes bring about the death of the tournament?